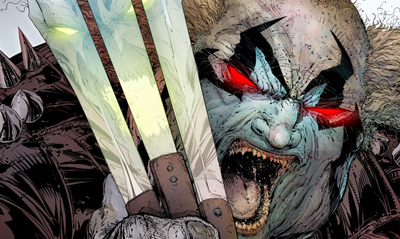 'Clowning around' definitely isn't a trait of Image Comics in 2012. Highest selling comic of the year in Walking Dead #100, a hit TV show from the same franchise and creators with funny last names and accents like 'Morrison', 'Vaughan' and 'Hitch'. Still the fat lady hasn't sung yet, and in December Image still have a few high notes to hit before their year draws to a close. Of all their monthly offerings, these three covers are the most pitch-perfect. I honestly can't say this enough - if you are not reading SAGA, you are missing out, and quite frankly may the fleas of 1,000 camels infest your bed until you do so. It is an unbelievably human romp through inhuman worlds and eyes, and a consistent reason to feel good about comics after every issue. Image says: Former soldier and new mom Alana has already survived lethal assassins, rampaging armies and alien monstrosities, but now she faces her greatest challenge yet: the in-laws. 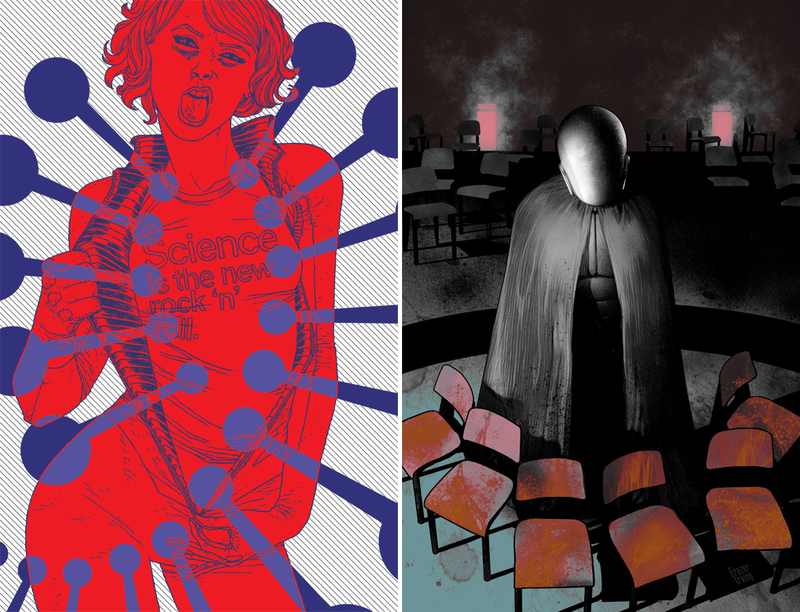 Nowhere Men #2 - Nate Bellegarde and Fonografiks Science may be the new Rock 'n' Roll, but Brit-pop style will always go down well! What do you think? Sound off below. 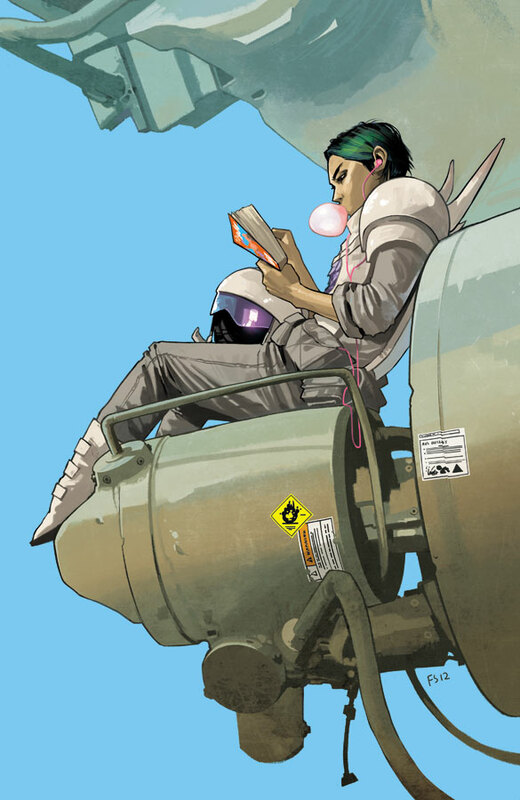 For December 2012 solicits from other publishers as they're released click here, or for Image Comics' full December line-up, follow the jump! Okay. I'm gonna go see if I can get Saga on digital. If not, I'm pre-ordering the graphic novel collection. You sold me. And dang, I love that cover for Bedlam. It's just freaky in all kinds of good ways. Like, who's coming in those doors in the back that are smoking? And what's with the splattered empty chairs? It would be creepy without the mirrored masked dude standing in the middle. You'll be glad you did Random! the books taking a few weeks hiatus so Image can release the collected edition of the first arc at a pretty cheap price, so that could always be a goer. I'm going to be covering it more here too, so if ya do get it, let me know what you think! Well. I downloaded 1-6. And read them. I was already in love with BKV. I am now willing to sell him my children if he writes faster. And dang, Fiona Staples...she's just amazing. This book...everyone should read this book. It's new. It's different. And it's completely addicting. You forget you're turning pages. It's that engrossing. Dan. I owe you. Big time. I don't want those fleas in my bed! I'll have to look for saga. Never noticed those around here. Aliera, you won't regret it. I have a feeling it's one of those comics that'll be kept around to pull out and re-read over and over again. Glad you loved it too Random! It is a monthly reason to feel good about comics. Quirky characters, creative worlds, scenarios that dont talk down to you and with unbeliveably real dialouge (esp Alana lol) oh yeah and two words - lying. cat. how fiona draws facial expressions is stunning enough but how she draws so clutterfree and imaginitively yet still with just enough detail to tell the story is beyond me. and Brian gets involved in the letter pages. sigh needless to say I love this book and will be featuring it more on IADW. Aliera if you try it (all covers are just as stunning by the way) i hope you'll dig it just as much as Random and I do. Then we can all be flea free. and isnt that all you can ask in this life. Oh man. Lying Cat. I love Lying Cat. Perfection in a sidekick. And oh yeah, Alana's dialogue just kills me, especially as a foil to her husband. Who talks with a bit more...um...flair? Is that the word I'm looking for? And she cuts through the bullcrap so lovingly, you just have to laugh. And I must say, that is quite frankly one of the most accurate portrayals of childbirth I've seen from a dialogue standpoint. Y'know. Except for what happens directly afterwords. But they're aliens. I was laughing and crying within two pages. That's successful comic book writing. Lying Cat'sfacial expressions are the best. Alana's dialouge often cracks me up.. She's the reader I think. her frankness with her hubby not only sounds like a real couple but has the reactions a reader usually would to 1/2 a guardian angel and a rocket ship made of wood. Looking forward to the second arc! I have to go and find this!